For a content used in Joomla Article Manager, the only require field is the title, but you can save what you want in this title. Select "As Title Only" if you want create the content title only with this text field. 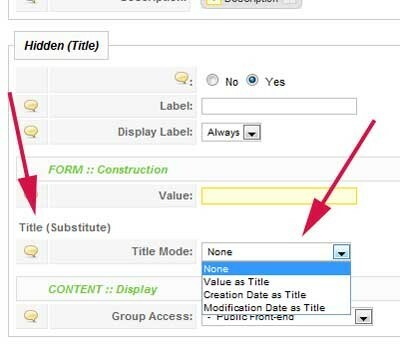 Select "As Title (Multi-Fields) & Text" if you want use this text field in your content title but in combination with other fields. To insert a static string in content tile select "Value as Title". In this case the default value of the hidden field is inserted in your content title. To insert a date in content title use "Creation Date as Title" or "Modification Date As Title". jSeblod CCK allow you to create a title with any text field or hidden field. So you can have a dynamic field (text field) selected in the form, or a static value (hidden field). But much better, you can create your title field with many field values. For example : build a title like "My Restaurant : reserved by Mr John". You can consider the string "My Restaurant : reserved by " as a hidden field with this static string as default value and "John" as a text field which is fill by the person who reserved. build a title with the lastname and firstname of the user who submit the content. 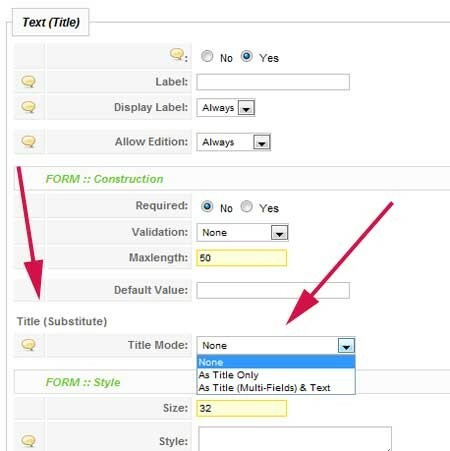 Insert in your content type 2 text fields one for the lastname and the other for firstname, select for both text fields the option "As Title (Multi-Fields) & Text"
Download a little CCK Pack demo for the concatenation field in title. Upload it. Then please create a new article using the "Demo Title" content type. Let's fill the form and save it. You will see that your article title has just been created dynamically using field values. ( 2 hidden + 2 text fields ) Hidden & Text type fields got this new feature called "Title (Substitute)" which allow you to create the title you want for your articles. Edit the 4 assigned fields in order to see the Title (Substitute) attribute.